The week of July 13, 2015 saw the first stage in the efforts to preserve and restore the late artist Roger Chomeaux (or Chomo)’s Refuge, one of the most important buildings in his Village d’art Préludien, but the one that has suffered the most deterioration over the years. This restoration will develop in two phases: 1) preventative measures taken to arrest further deterioration and decay, to be undertaken during summer 2015 and 2) actual restoration of the Refuge, to be undertaken during summer 2016, if sufficient funds can be raised. Under the direction of Fabrice Azzolin of the École des Beaux-Arts of Nantes, four young students are working on this first phase of the restoration. They first constructed a wooden structure to temporarily protect the Refuge, which is rusting, in order to ensure its security over the coming year. These students lived in Chomo’s Village for around ten days, and just by living there they resuscitated the site and breathed new life into it. The week of July 13, all of those present ate together in the forest, in the middle of Chomo’s Village, in front of the house. The young students had access to the kitchen and they prepared a magnificent meal. In order to do this, they were inspired by Chomo’s sculptures, so they sculpted steamed carrots and other vegetables, and played with other different ingredients in order to create plate-sculptures. Chomo would have adored that! At the end of the meal, the students even improvised a jam session with different musical instruments, including guitar, flute, and harmonica. It was unbelievable to hear such beautiful music in the heart of the forest. The event, which brought in supporters of Chomo’s Village in addition to the Beaux-Arts contingent, was organized by SPACES Board member Laurent Danchin, who has written widely about Chomo and who has been the leading force in the campaign to save and preserve this important art environment. Sign petition to help save Roberto Pérez’s Spanish art environment! Support the Conservation of Chomo’s Village of Preludian Art! ﻿SPACES Board member Laurent Danchin has launched a campaign to restore components of the Village d’Art Préludien created by Chomo (Roger Chomeaux, 1907-1999) in a small parcel located within the Fontainbleau forest in France. Although Chomo studied and successfully created and exhibited his work within the art mainstream as a young man, in 1960 he moved to this site, became a hermit, and spent the rest of his life creating an impressive environment of idiosyncratic buildings as well as numerous sculptures; most of the work was fabricated from recycled materials of all types. He named the site to reflect his feeling that his art served as a prelude to a new world that we would be soon to enter. l´Église des Pauvres (The Church of the Poor) at night, 2009﻿. Photo by Laurent Danchin. The emphasis for the first phase of this conservation project is to restore Chomo’s Refuge; most of the other buildings, amazingly enough, are still in excellent shape, even after fifty years in the forest. Nevertheless, vandalism, theft, and deferred maintenance have taken their toll. Students and alumni from the Nantes School of Visual Arts will be guided by Fabrice Azzolin, teacher at the school and president of the IRES institute (Institute de Recherches et d’Études Scéniques). Future plans include the construction of an enclosure that will surround and protect the site, and, ultimately, the development of a study center where creators and thinkers from all fields will come together to share their ideas and their knowledge. For further information, or to contribute to this project, contact Laurent at laurent.danchin@free.fr. The International Award for Public Art (IAPA) honors excellence in the field of public art, increases visibility for public art internationally, and fosters knowledge through research, discussion, and debate. IAPA was created in 2011 by Forecast Public Art (publisher of Public Art Review) and Shanghai University’s College of Fine Arts (publisher of Public Art) with the aim of propagating knowledge about the practice of public art globally. The Institute for Public Art was established to further the process of researching and support efforts to host the award event and related forums. Beginning in late 2013, Forecast Public Art began accepting proposals for hundreds of noteworthy recent public art projects from around the world to consider for the 2015 award; 125 exemplary projects were ultimately nominated. The field was then narrowed by an international panel of jurors to 32 semi-finalists, and then, ultimately, to seven finalists, one from each of the global regions. While the ultimate winner of the2015 IAPA award was a project focusing on sexual violence in India (“Talk to Me,” 2012, by the artist collective Blank Noise from Bangalore, India), Pujiula received an award of special distinction for his 45 years of construction of the Labyrinth and Cabins of Argelaguer. Josep Pujiula i Vila (b. 1937) is a self-taught artist who, driven by personal passion, created a monumental artwork that has become central to the shared public identity of his village in the province of Girona in Spain’s Catalonia. Vila received no underwriting, sponsorships, or funding besides coins dropped into an improvised donation box. Yet, working for over 45 years on three separate, massive constructions, he has ignited the passion of the villagers, who are now working actively to preserve his artwork and reclaim it as emblematic of their locale. Pujiula, a retired factory worker without his own land, built his structures on someone else’s private property. His first, straightforward architectural installation evolved into a second, more artful and expansive multilevel construction project. Created from branches found on-site, this second work of art included seven 100-foot towers, innumerable bridges, shelters, walkways, and stairwells, and a labyrinth over a mile long. Working alone, with impressive technical prowess, he constructed soaring spires as well as graceful passageways and shelters with superficially fragile materials. He confidently adjusted to changes, opportunities, imperfections, and a lack or abundance of materials, improvising and integrating contingent elements. No formalized written plans ever existed for his elaborate constructions. Tens of thousands of visitors passed through the site annually. Their ability to physically interact with Pujiula’s constructions energized and emotionally impacted them: “Thanks for making us feel like children,” read an anonymous note. In 2002, Pujiula was forced to destroy the second iteration of his spectacular public project by the village government and state authorities, despite petitions from protesting supporters worldwide. Undaunted, Pujiula moved to a nearby site and began again. The third, monumental version (2007–2011) was elegant and extremely complex, evidence of his maturing aesthetic sense and his sharpened technical skills. To enhance durability, he also began working in stone, concrete, and steel, and soon his constructions again had become one of the world’s largest art environments, comprising eight towers, a new labyrinth, and numerous kinetic sculptures and cascading fountains. Nevertheless, in 2012 Pujiula was forced yet again to dismantle and burn all of the wooden components. Today Pujiula—along with the energized villagers and thousands of international supporters—is fighting to save and conserve what remains, and in the fall of 2014 his work was finally acknowledged by the county and municipal governments as a local heritage site. His work has become the very symbol of Argelaguer, while at the same time it has gained increasing global importance, thanks to his innovative design, the monumentality of the construction, and his formidable tenacity. Help Fund the Ed Galloway Totem Pole Restoration Project! Ed Galloway’s Totem Pole Park (built from 1937-1948) located within the Rogers State Historical Park in Foyil, OK, is in need of conservation. Although the site, which includes a 90-foot concrete totem pole surrounded by several smaller totems and a small octagonal building, has been restored several times over the years, with the exception of the work sponsored by the Kansas Grassroots Art Association almost two decades ago, none have been of sufficient quality, nor sufficiently durable. You can find out more about the project through their recent Kickstarter Campaign page, here. And, as always, learn more about the site on the Ed Galloway Totem Pole page in our Online Collection, here. Mr. Chand at age 76. Image via Reuters. Mr. Chand‬ built the ‪Rock Garden‬ of Chandigarh as his vision of the divine kingdom on Sukrani on a land conservancy gorge near Sukhna Lake. In 1975, at around 13-acres, his guerrilla artwork was discovered by authorities and was in danger of being demolished. Thanks to the public’s advocacy, in 1976, it was designated a public space, and Chand was given a title (Sub-Divisional Engineer), and a salary to continue building and maintaining it, along with a workforce of 50 Laborers. The now 40-acre site is visited by 5,000 people daily, and is one of the country’s most popular tourist destinations. Below, enjoy a video on the on-going conservation of the Rock Garden of Chandigarh. If you have images of, or documentation on Nek Chand’s Rock Garden, and would like to submit that detail for the Rock Garden page on the SPACES Archives Online Collection, please contact us HERE. 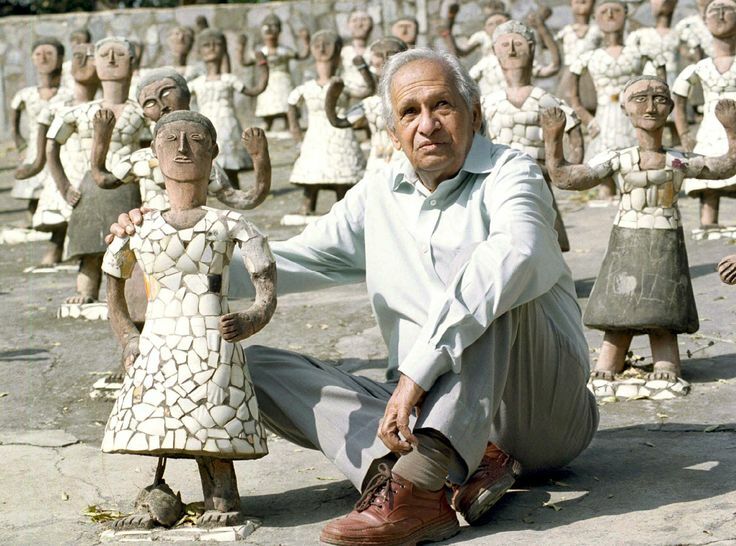 Nek Chand’s Rock Garden - Work In Progress from Alan Cesarano on Vimeo. SPACES Board now stretches internationally! SPACES is thrilled to be included in this grant alongside other impressive cultural organizations like the Alliance for California Traditional Arts, NYC’s CityLore, the Louisiana Folklife Program, and the Philadelphia Folklore Project, to name just a few. We greatly look forward to developing increased awareness and access to our unique collections through the Folklore Collections Database in the coming years, and are thankful to the American Folklore Society and the National Endowment for the Humanities for making work this possible. We’re pleased to share news of the upcoming Singular Spaces exhibition at UCLA’s Fowler Museum, featuring photographs by SPACES Executive Director Jo Farb Hernández which﻿ document eight self-taught artists from across Spain﻿. ﻿﻿The exhibition, which opens on April 12, and runs through September 6, 2015, explores Hernández’ extensive study of Spanish environmental artists — she crisscrossed Spain from 2000-2014, traveling tens of thousands of kilometers to meet and interview artists and document their work. Comprised of intriguing and idiosyncratic sculptures, gardens, and buildings, the artists developed environmental sites organically without formal architectural or engineering plans. Often highly fanciful and colorful, the sites are frequently characterized by incongruous juxtapositions. This is the result of the artists finding inspiration in their surroundings and making do with what is available. The environments these artists create become a visual cradle-to-grave accounting of how their creators have spent their lives and what was important to them. On Thursday, April 16, at 7:30 pm at the Fowler Museum on the campus of UCLA, Hernández will discuss her photographic survey of these elaborate fanciful art environments and idiosyncratic sculptures of self-taught Spanish artists. Hernández, who is a professor at San Jose State University and Director of the University’s Thompson Art Gallery, spent close to fourteen years researching this project and writing the almost 1200-page book complementing the exhibition. A 6 pm concert of Spanish guitar music and light refreshments precedes the talk.﻿ RSVP to the event on Facebook. Divine Disorder participants gather between presentations. Photo courtesy NCPTT. ﻿Every four years, the National Park Service’s National Center for Preservation Technology and Training puts together a rare convening of folks with both a professional and personal interest in the preservation of art environments and self-taught artistic work. The second annual Divine Disorder Conference on the Preservation of Folk and Outsider Art met February 24-26, 2015, drawing ethnographers, art historians, art conservators, historic preservationists, and museum and archive professionals alike to Atlanta, Georgia’s High Museum of Art. SPACES Director Jo Farb Hernandez speaks at 2015 Divine Disorder. Photo courtesy NCPTT. Presentations covered the range of discussion on conserving, preserving, documenting, and interpreting art environments and self-taught works. SPACES Executive Director Jo Farb Hernandez spoke on curatorial roles and responsibilities in working with art environments, while photographer Fred Scruton spoke about his work documenting the “personal iconography” of Niagara Falls artist Prophet Isaiah Robertson’s church and home. A Finster piece at the High Museum of Art, Atlanta. Photo courtesy NCPTT. Others presented updates and best practices on conserving/restoring art environments, or in building local support for the preservation of a site. This included dispatches from the preservation efforts surrounding the E.T. Wickham Stone Park in Palmyra, Tennessee, Margaret’s Grocery, built by Rev. H.D. Dennis’ in Vicksburg, Mississippi, and the Vollis Simpson Whirligig Park in Wilson, North Carolina. Most notably, Terri Yoho, Director of the Kohler Foundation, a Wisconsin non-profit with a dedicated focus on the preservation of art environments, presented Kohler’s current project: The multi-stage restoration of Pasaquan, St. EOM’s seven acre art environment in Buena Vista, Georgia. Art conservators working on the Pasaquan project also spoke to the unique process of restoring such an expansive site, leaning on the wealth of primary documentation and local knowledge of the site to aid their work. Divine Disorder participants tour Finster's Paradise Gardens. Photo courtesy NCPTT. The third day of the conference took participants up to Summerville, Georgia to see, first-hand, the renovation of Howard Finster’s hallowed art environment, Paradise Gardens. The Paradise Gardens Foundation assumed leadership of the site in 2012, in partnership with Chattooga County, Ga.
Director Jordan Poole led a tour of the snow-covered Gardens, and spoke about the site’s renovation process, largely supported by an Art Place America grant, but further supported by local investment in the Gardens as a key platform for economic development, cultural tourism﻿, and public programming. Folks who could not be at the 2015 Divine Disorder conference are able to access abstracts of each presentation on the NCPTT conference website, and will soon be able to stream videos of the presentations. The next conference is tentatively sheduled for 2019. Be sure to mark your calendar now. Howard Finster's decorated car. Photo courtesy NCPTT. A presentation by Norman Girardot at the new gallery expansion to Finster's house. Photo courtesy NCPTT. Detail at Finster's Paradise Gardens. Photo courtesy NCPTT. Participants of the 2015 Divine Disorder on the steps of Finster's home at Paradise Gardens. Photo courtesy NCPTT.